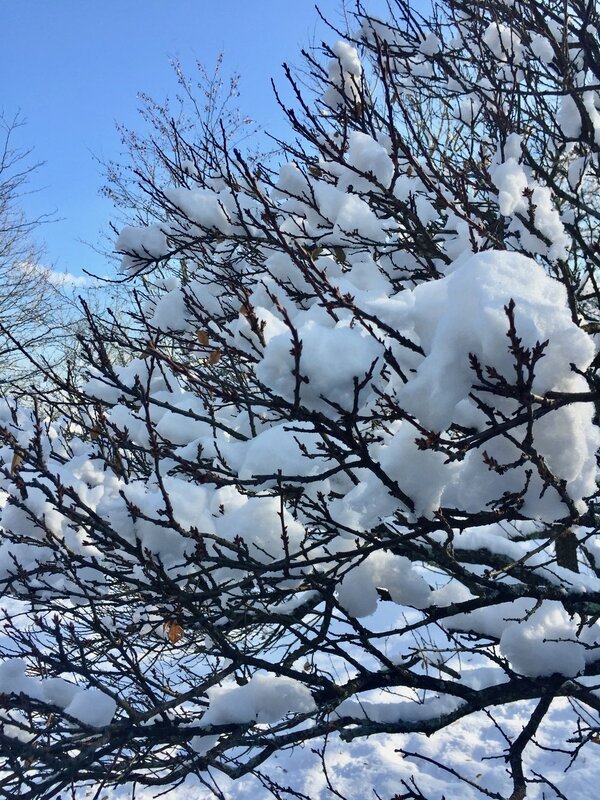 We wish you all happy holidays however you celebrate the mid winter solstice...with candles, with hope, with family and love, with evergreens and warm fires, and good food shared among good friends, with Christmas, Hanukkah, Kwanzaa, or other traditions. We are off! on a big trip to far away places. We will keep in touch mostly through posts on Instagram. We wish you all the very best as we all hope for a new year full of light and hope and peace. We will be back with blog posts in early February! One of the things that we have worked on with teachers during the past few months is supporting children's developing skills in seeing, noticing, describing and drawing. 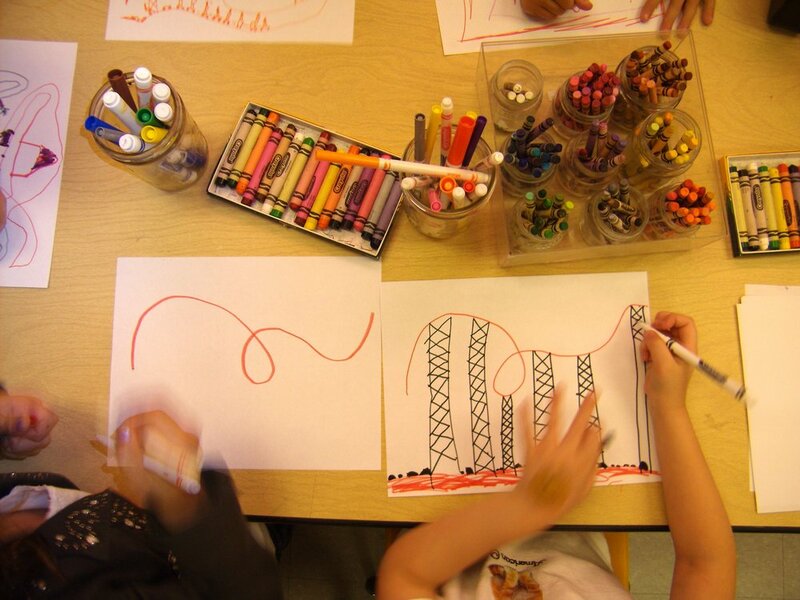 Two schools where we have seen remarkable work lately are Principia Preschool in St. Louis and Charlestown Nursery School (CNS) in Boston. Louise co-facilitated small group work with teachers at CNS in October when we collected leaves, described them and learned the technique of "bug drawing." 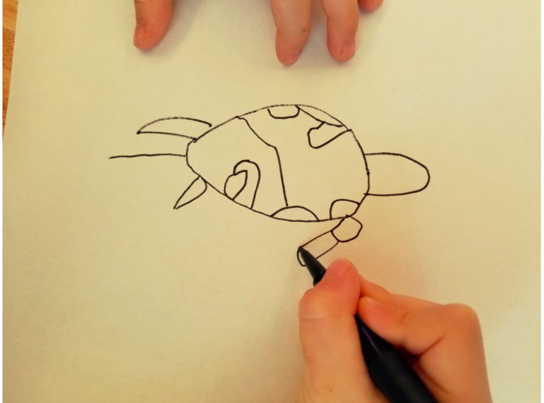 Bug drawing is a way to describe contour drawing that seems to work well with children because it is so specific and appeals to their imagination. I demonstrated as I explained how this works...You pretend that you are tiny insect crawling along the edge of the object, in this case an oak leaf. You follow each turn and bump and curl that the insect crawls around and you follow that path with your pen or pencil on your paper. This is truly hand eye coordination. And it means slowing down to really notice what you are seeing. When this is explained to four and five year olds, or even three year olds, most of them understand what you are saying and doing and some of them like to try. Some of them go about drawing in their own way. And all this is great. Whatever happens, you have given them a tool that might help, focus, and connect with seeing and with making marks. The two CNS teachers shared these small group experiences with their colleagues during a professional development day using video clips, transcribed conversations with children, and photographs of children's work. We used the Collaborative Assessment Protocol to unpack the experiences together. In this way, all of the teachers at CNS could share in the new learning of the children and the teachers who were leading the experiences. Then, we shared a drawing workshop with the teachers who tried their own hand at bug drawing. At Principia, we have explained this way of working through Skype sessions with teachers. Even through virtual collaboration they have understood this approach well enough to be highly successful in their work. For example, a group of preschool students were recently involved in a turtle tracking experience on their campus. The children became very interested in turtles and the teachers gave them more of an opportunity to study different kinds of turtles and to use the bug drawing technique to help them notice even more about the design of different turtle shells, how the shell works with the turtle's legs and head, about the patterns and lines that define the turtle. Give this a try if it appeals to you. It most likely will turn out to be a fun and worthwhile experience. Then, this way of seeing and drawing becomes another part of the toolbox for noticing, representing, valuing and understanding the world. And, If you are looking for more ways to explore line with children, visit this remarkable resource created by author Cathy Topal. It gets dark so early these days. And wind whips around gray skies. And the rain falls and snow flies. November is soon to turn to December. Winter and darkness are upon us. 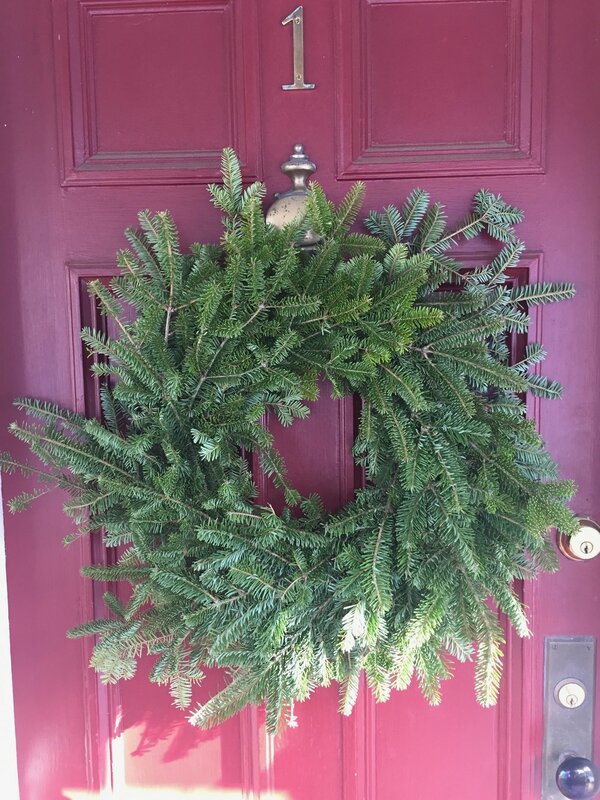 And in the midst of all this is the season of holidays, time with family and friends and warm fires and candlelight. We hope that all of you had a wonderful Thanksgiving and a rest from everyday duties. We did. We had a house full of our sons and daughters-in-law and two grandchildren, 5 and almost 3. We feel so grateful for all of them. There is so very much written about gratitude and its benefits in our lives and I am pretty sure all of it is true. I don't know if many of you know On Being and Krista Tippet's interviews with all kinds of people. It always inspires us to listen. On the On Being website, there is this archive dedicated to many interviews and articles focused on gratitude. And have you heard this TED talk by Brother David Steindl-Rast? I listen to it often and try to remember every day what Bother David says. We are grateful for all of you with whom we work...grateful for the chance to make a difference in the lives of children, grateful to spend meaningful moments with teachers and children in schools, and to continue to be able to engage in wonderful work with wonderful people. 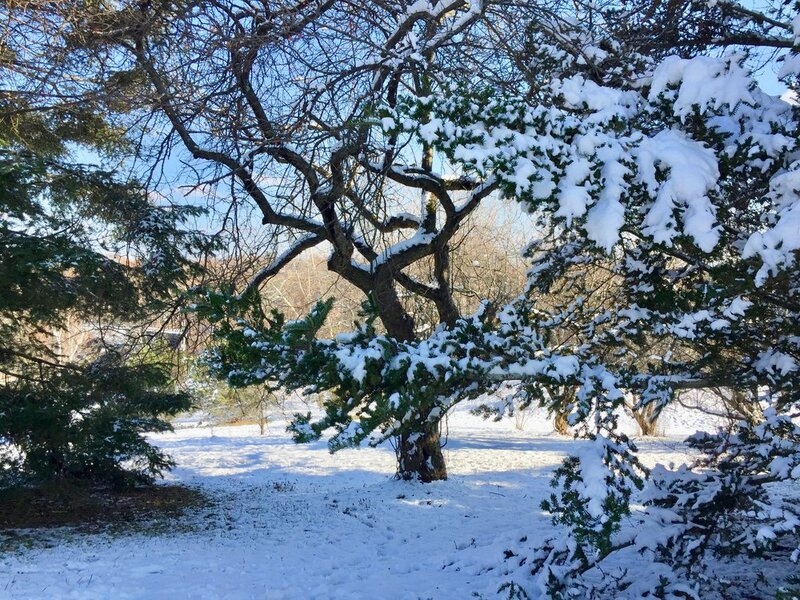 With gratitude to all of you and best wishes for a wonderful December! On October 28th I attended my first Rounds with Steve Seidel, Director of the Arts in Education Program at Harvard Graduate School of Education. 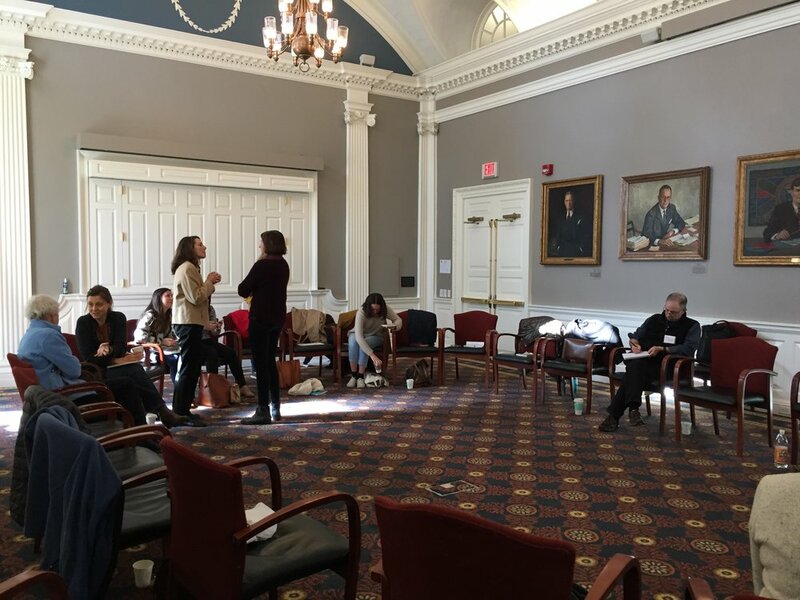 I have heard about Rounds for years and finally I was able to show up to participate in a wonderful morning of professional development with a diverse group of professors, students and teachers from around Boston. Education has very few opportunities for the kind of lifelong professional learning that those in the medical community can access. At Project Zero we have been engaged since 1995 in an effort to create a powerful learning community based on the medical model of "rounds", where doctors young and old come together to share knowledge and practice clinical diagnostic skills...ROUNDS is a monthly discussion group giving educators an opportunity to gather and discuss emerging issues in educational practice, to present their personal puzzles about teaching and learning, and to practice looking at student work together... Everyone is considered to have special perspectives and expertise to offer the group, and those who attend engage in serious and spirited dialogue about educational matters. How do you create a classroom culture where learning is seen as an adventure of joy, challenge and the unexpected, also when addressing serious and sometimes troubling learning topics? Such a range of thoughtful responses to this question ensued with many examples that demonstrated how this kind of teaching and learning can be put this into practice...often through students making beautiful work that contributes to their communities' health and well being, innovation and problem solving, healing and growth. The second part of the morning was dedicated to looking at a collaborative drawing done in a free period by a group of third grade students. We followed the Collaborative Assessment Protocol carefully. I have facilitated this protocol with many groups of teachers and it was such a joy to participate with Steve who is the author of the protocol and a master at leading it. The drawing was a Halloween drawing and full of fun and fantasy. We all learned much through paying such close attention to what the students had created. I can't wait to go back to Rounds. Undoubtedly, attendance will inspire me to spiral outwards with what I learn and to design ever more thoughtful opportunities for learning with the teachers with whom we work. If you are in Boston on a Saturday morning, check and see if Rounds is scheduled. I promise you, you will learn in adventurous, joyful, challenging and unexpected ways! I've been ruminating on how to get better input from the students for our newsletters. Here's my idea - I’d like to focus on one area a day and have a conversation with children in that area. The purpose would be different than listening for a “story.” In these brief conversations, we would be looking for descriptions of what children are doing and what they like about the area so that we could include their ideas in the newsletters with photos. I share my response here because I think it could be useful to others. First of all, your newsletter is extraordinary. I think the idea to focus on one area a day is a good one. You might think of it as a research project. What are the children doing in the area? What materials are most “fertile” for generating creative ideas? As you observe, what connections are the children making? and in both…what are the connections they are making between two different ideas…are they inventing something new by putting two or more ideas or materials together? Looking for the scientist and/or the artist may sound too simplistic, however, what I like about your original proposition is that you are choosing a focus for your observations: the areas of the room. To then look for the scientist and/or artist might further focus your research. I don’t mean to exclude seeing and hearing other things. You will always have your peripheral vision open. It’s just that sometimes the classroom is like forest, or even a jungle, of so many different things going on that you, the teacher, don’t actually see or hear the thoughts being developed. That’s why I like your idea to chose one area of the room each day. Over time, you will collect a collage of ideas, a mosaic of your classroom.